More than 965,000 adults in the Chicago market read the Daily Herald in print or digital versions, or read Reflejos. 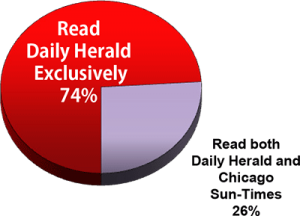 Our readers are not effectively reached by other metropolitan Chicago newspapers. 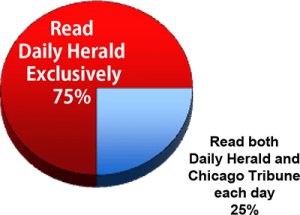 The Daily Herald audience is more upscale than audiences of other Chicago newspapers. Source: Scarborough Release 2 2013 – Duplication/Exclusive Readership is based on the DMA+ Geography and Daily Readership of the Daily Herald. Source: Scarborough Release 2 2013 – Integrated Newspaper Audiences (INA) in the Chicago DMA+ Geography.